Osprey Raven 14 Rucksack/Hydration pack. The Osprey Raven makes fair claim to being the best women's-specific cyclist rucksack / hydration pack we've had the pleasure to offer. The rucksack's 14 litre capacity takes all you would probably need for a self-sufficient day out without overburdening you. 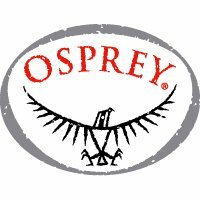 Its female-friendly harness/strap system and its vented cushioned back is so well designed, the very fact that you're carrying it in an Osprey Raven 14 pack seems to lighten the load. The Osprey Raven 14 Rucksack's 3 litre reservoir means you should never thirst. This Osprey Hydraulics Reservoir is one of the best in the business. The comfortably padded Airscape back panel is ridged to ensure maximum comfort and airflow. The ToolWrap tool roll, stowed in the lower pocket, is a work of genius. The 2 x zipped hipbelt pockets are a particularly convenient place to stash keys and small change you might want to access on the move. Main compartment dividers make it easy to organise your change of clothing. Its LidLock is the neatest attachment we've seen for carrying a lid safely secured to the outside of the pack. An LED strap lets you position a rear light in an easily noticeable location. Compression straps help stabilise the pack's load. 'Featuring a women's specific fit, the Raven 14 and integrated 3 litre Hydraulics™ reservoir ensures that you can carry all the required gear and liquid to perform your personal best. The reservoir is accessed via an asymmetric zip for quick and easy refills. The reservoir also incorporates a unique hydrostatic plate that maintains an anatomical shape but also keeps water pressure high for a smooth delivery of water. We also solved the ‘wandering hose’ issue with competitor designs by placing a magnet in the pack sternum strap and bite valve. This holds the delivery system neatly in place when not needed; yet ensuring quick and easy access when it is. The AirScape™ ventilated foam back panel and harness keep you cool in hot conditions whilst still offering flexibility for movement without restriction. Our unique LidLock™ attachment provides a quick and secure attachment point for your helmet without taking up space inside your pack. All your gear is easily organised and carried within the quick access internal compartments. The base of the pack contains our rapid access ToolWrap™, storing all your bike tools in a single “go-to” place. The front compression pocket stores more gear securely and the stretch pocket complete with drainage hole, provides an ideal space for bulky additional items or can be used to stash wet items on the go.